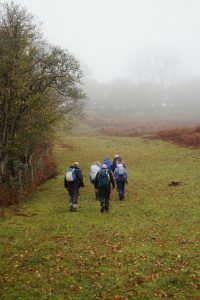 We set off from the car park at Fro in light drizzle which quickly cleared for the majority of the walk leaving us to enjoy the fabulous Autumn colours throughout our seven mile walk. Our route took us up to the pretty church at Partrishow, which made a good lunch spot as the porch offered seats with a view down valley and we were thankfull to not be at the top of the thick mist covered peaks above. Dropping down into the valley we walked through the well kept grounds of The Pant and along the duck boards of the bird reserve. The weather closed in just towards the end of the day which helped justify the well earned pint at the Skirrid Inn to finish the day off nicely.